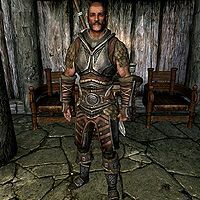 Gregor is a Nord warrior found in the White Hall in Dawnstar. He becomes your personal housecarl when you have earned the title of a thane in the Pale. He seems to patrol around Heljarchen Hall, constantly circling the building. Gregor is outfitted with a set of steel armor. Oddly, he is equipped with a steel greatsword instead of a one-handed weapon, unlike the other housecarls. Despite this, he still carries a steel shield. In addition to the standard housecarl dialogue, Gregor has several unique lines. If you ask him to follow, he'll remark: "I'm with you, Thane." At that point, he'll greet you with: "What is it, Thane? ", and after conversation may utter: "Onward, then." If you tell him to wait, he'll loyally point out: "Don't be long. My place is by your side. ", and subsequently greet you with: "I await your command, Thane. ", possibly adding the following as you end the conversation: "I'll wait for you here." When you ask him to trade items, he'll joyfully claim: "What's mine is yours, Thane." If you tell him it's time to part ways, he'll head back to the White Hall after saying his goodbyes with: "As you command, Thane. I'll wait at the White Hall in Dawnstar until you need me again." If you've finished at least one room of Heljarchen Hall, he'll instead make his way over there after saying goodbye with: "As you command, Thane. I'll guard Heljarchen House [sic] until you return." He is the only housecarl to carry a two-handed weapon, despite being more proficient in the One-handed skill. This issue has been addressed by version 2.0.1 of the Unofficial Hearthfire Patch; he is now equipped with a steel sword instead. Gregor may fail to settle at Heljarchen Hall and instead patrol one of your other properties.